WTH Happened?? How did we get here? The double edged sword of technology. Take a moment and think about all the advances that have been made in the last 20 years, cell phones became smart phones, computer labs gave way to home computers then the internet allowed an explosion of information and networking. It seems that the common theme of this technology race is making our lives ‘easier’ and in some ways I guess that is true. It is much easier to just call someone from our smart phones then having to stop and use a pay phone or waiting until we get home to make a call (for those of you under 20, yes we actually used to have to do this). And now you can use an ‘app’ to order your fast food before you arrive, so I guess this makes things a little easier. But in other ways, technology has led to a significant shift in complexity, take for example our vehicles. I still remember the auto shop at our high school where guys (and a few gals) would learn how to rebuild engines and tune up cars. The good mechanics back then could listen to a car running and figure out the origin of the strange noise or problem. It used to be you could learn from a mentor and then with time and experience become a good mechanic. But, have you taken a car in lately? The first thing they do now is to hook it up to a computer and start working through all the various sensors and computer systems. It seems that the actual mechanical functioning of the engine or transmission are way down the ladder of complexity. Our vehicles have become so complex that if the computer can’t figure out what’s wrong then there is confusion and a need to run more tests. The days of a friend or relative fixing your car is quickly becoming a thing of the past due to this increased complexity. It seems that the same is true for almost every other machine or device we work with TVs, Computers, DVR’s, even copy machines. We’ve gotten to the age of relying on technology but then when something goes wrong we are stuck, you have to find someone to try and fix it, but it won’t be a friend or relative and even if you do find someone it seems the standard answer now is… “It’s not worth repairing, just throw it away and get a new one.” So, what started out to make our lives easier, actually has the exact opposite effect by making it so complex that we have lost the ability to ‘fix’ anything and the answer becomes just to discard it and start over? It seems we have accepted this reality for a majority of the machines we work with. But, what if it’s a machine that we simply can’t throw away? And, to make matters worse this machine is so complex that even after thousands of years and millions of articles and theories from some of the top thinkers we are still learning about the functioning of the machine and the interaction of all its parts? What then? Who do we turn to? The one thing we’ve learned about these complex machines is that they are expensive to fix so the more careful we are with them the better the chance of extending their lives. Just break the glass on the iPhone and this will become painfully obvious. If you want to destroy your new car quickly just put in the wrong fuel, don’t replace the oil or do any maintenance just drive it hard until it breaks down. Do you often walk into a room, only to realize you have no idea what you walked into the room for? Do you open the fridge only to stand there mindlessly trying to remember what you were going to get out? Do start to look up some information for work only to realize you've just spent 30 minutes watching the latest video of baby's laughing or animals playing or "hey, check out this stupid human trick." Only to then wonder, "what was I looking for in the first place?" Who moved my keys, I know they were right here? Do you go to the grocery store for a couple things only to return with several items and then realize you didn't get the things you originally went for? Increase your exercise and activity level (I swear I'm not making this up) increasing your exercise and activity level has been shown to improve mental functioning. Focus-Why do we have a hard time remembering peoples names? Its because most of the time we aren't even paying attention when they say it. In this "age of distraction" and constantly being entertained by our 'smart' devices it's no wonder we are seeing increases in CRS. File-Utilize a mental filing system to organize our mental lists or thoughts. Picture-associate a picture with what you are trying to remember and it improves retention. The more of your senses you utilize the stronger the retention. Review-repetition is the key to improving memory, the more you review the stronger the memory will be. So, does it actually work? Yes, like anything it takes practice but Ron was able to remember a 50 digit unique number forward and backward utilizing his system. Memory Improvement Training - How to Videos - YouTube Here is a link to one of his You Tube videos, just don't get lost in there for several hours. I think the real take home for me from this presentation were that first and foremost it is another area that improves with increased activity and better nutrition and second that we can improve any skill with a system and practice. Don't allow poor health and 'Distraction' to make you a CRS sufferer any longer. Put down the smart phone and walk away, Literally and go for a walk, then continue to increase your activity, feed your body the nutrients it needs to perform at its peak, Mix in some fruits and vegetables and give your mind a break from the constant stimulation of the 'Age of Distraction' you just might realize there are people around you that you can focus on or maybe even improving yourself. Good Luck out there. Fat to Fit? Just Teleport! "Beam me up, Scotty!" Whether you are a fan of Star Trek or not, this has become one of those well know phrases. I was never a big Star Trek fan but there was just something cool about the teleportation and how it could immediately get them from one place to another. I really wished it existed when my family would take vacations that entailed driving several hours in the car and I still wish for it when we drive to Lake Tahoe (366 miles). I find it interesting that when we are faced with a journey the first thing we consider is how will we get there. We would never consider walking to Lake Tahoe unless we wanted a lot of exercise and the reality that it would take around 73 hours walking at a pace of 5 miles/hour. We could choose a bike to speed up the time but again it would be an arduous trip and still take four times longer than driving especially hauling the luggage. We have other options if we don't want to drive we could always take the train or fly. While it would be great to simply teleport there, sadly that isn't an option and we realize that if we are going to get there then we have to take one of the available methods. Each method has its pro's and con's that must be considered. Where exactly we are headed? How much time to we have to get there? The amount of stuff we are taking with us, etc. We accept this reality whenever we are going on a journey, well, at least traveling. For some reason we refuse to accept this reality in all the other areas of our life especially our overall health. Regardless of whether we are talking about our physical, mental or spiritual health most people treat it like an episode of Star Trek. We playing the role of the fearless James T. Kirk disregarding the logical advice of Spock only to find ourselves in a dire situation. When all seems lost we are able to get a message to Scotty, "Beam me up!" I don't want to be here any more and we need the quickest, easiest method to alleviate the problem, teleportation. A perfect example is our physical health. While it has been shown over and over again in the scientific literature the best way to stay healthy is to maintain an active lifestyle, get enough sleep, eat nutritious foods (a majority of which need to be plant based), take time to work on our relationships and also ourselves but this is all just Spock's logical musing. We disregard this for the excitement of the adventure and then one day we realize we are in a bad situation, our health is suffering, we have gained weight and are stressed out do to a lack of sleep, poor health and failing relationships. So we search for Scotty, we need him to beam us up out of this mess we are in. We are desperate for the quick fix and Scotty becomes the next fad supplement or diet, the magical program that will teleport us from our current state into the one we want. Weight loss is a $60 Billion Dollar a year business in America, so there are plenty of Scotty's our there to promise you a quick teleport to the new fit, healthy body that you are desperate for and look they have actual proof of before and after pictures to prove that they can truly teleport you. Back to my trip to Lake Tahoe, if I drive according to the rules (70 MPH) it will take me around 5 1/2 hours to get there. If I break the rules, I can get there in 4 hours (90 MPH) or even 3 1/2 (100 MPH) but I put myself at a greater risk, both physically and financially. It is no different with trying to lose weight, it is a journey of math. A pound of fat is 3,500 calories, so in order to burn a pound of fat you must burn 3,500 calories more than you take in. You can starve yourself or take stimulants to speed up the weight loss the same way you can speed when you are driving. The problem is that slow and steady will win the race when it comes to our health, can we cheat? Yes, but at what cost? There is no teleportation when it comes to our health and the only truly sustainable plan is to change our daily habits. We need to stop looking for Scotty to beam us up. Star Trek was a TV show and not real (sorry Trekies) and neither is any magical claim to teleport you to immediate weight loss and good health. It's time to listen to the logic of science and create a plan to change your daily habits. Start walking toward the destination of improved health and you'll find you'll find a truly sustainable journey. "There is hope to be healed, to be whole,..."
Yesterday was 'reality' Monday, as the world returned to the normal routine following a two week hiatus for the holidays. Kids returned to school, vacations ended, and New Year's Resolutions are now a week old. Local fitness centers have filled to capacity and there are a lot of people with sore muscles and aching joints from launching full speed into their new found desire for health. I truly hope that a majority of people stick with the their desire to make their life better in 2014 and yet sadly statistically very few will. Why is it so hard for us human beings to change our behaviors? Even with ever expanding access to information, albeit with a lot of misinformation, but still if we know what we need to do to improve our lives why don't we just simply do it?? 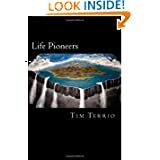 As I wrote about in Life Pioneers I think it starts with understanding the major events of our lives that have shaped us. The important thing to remember is that everyone has their story and each one is unique and filled with good and bad. Life is a roller coaster of ups and downs. The only thing that each one of us has complete control over is the choices we make. I have been blessed to know people from the entire spectrum, from the incredibly successful to the poorest of the poor. The one constant that I've found is that each one has their own life story and none of them are free from hard times. The difference I have seen comes in their reaction to the different circumstances life throws at them. Just like the lyrics of this song, "There is hope to be healed, to be whole, to be finally free. So don't give up on me." But we need to be telling ourselves this. If you are not where you want to be in any area of your life then realize their is someone out there who can help guide you in the right direction. The first step is to do the evaluation, then determine what the goal is and then create the plan to get you there. It's "Life Therapy" so "Please, please don't give up on (you)!"